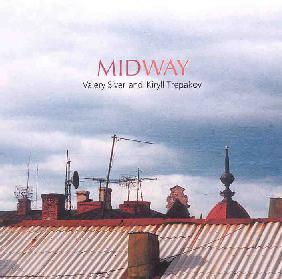 Valery Siver and Kiryll Trepakov - "Midway"
Valery Siver and Kiryll Trepakov are Russian musicians who have joined forces after having been active on their own for some time. Both are trained classical guitarists, which is prominent on the album, though keyboards, synthesizers and percussion are also principle instruments. The CD opens with "N-Tro", a song hinting that Midway might be one of the more Rock oriented of Electroshock releases. The song segues into "Stress" which picks up the pace a bit, being something of space/jazz fusion tune with a 70's fusion keyboard sound, soaring UFO synths, acoustic guitar and percussion. "Hot Wind" is an intriguing blend of melodic progressive rock, Anthony Phillips, jazz, and light drum ‘n bass rhythms. Scratchy hip-hop beats color "The Way". "Dansing" is a melodic spacey progressive rock tune that I enjoyed. Siver and Trepakov go even deeper into the cosmos on the lulling "Thirty Seconds" and "For A Lifetime", with their bubbling synths and mission control voice samples. For the most part the music is slow paced and highly meditative to the point of being hypnotic. Drifting waves of ambient drone are trademark elements as is the slowly soloing classical guitar. "Head On A Laps" is one of the most meditative tracks on the album with acoustic guitar, dreamy bass drones, and the sound of seagulls which conjure up images of drifting peacefully on the open sea. The song moves seamlessly into "Don", which picks up the beat with steadier percussion, deeper drones, pulsating alien synth embellishments, and much more of a "song" feel. Overall, a beautiful set of contemplative music with a welcome spacey vibe and some adventurous moments.